Used to keep your items from falling off the back of the shelf. Available in 2 sizes. Wire shelf back ledges come in sets of 2. Please note: picture may not reflect actual item. 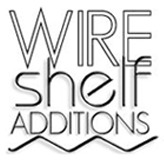 There are 2 sizes of back ledges available to fit the two most common wire shelf widths. These back ledges will fit any brand of wire rack. Make sure you measure your shelf to ensure you choose the correct size. Our back ledges are commercial grade silver finish for durability. They are very easily and quickly installed on any shelf. Ledges are sold in sets of 2.